The tool every home needs! Our flat bottle openers (or otherwise referred to as speed bottle openers, beer bottle opener or stainless steel bottle opener) are a staple in every kitchen and bartenders pocket. These Bottle Openers are quick and easy to use. The flat design is intended to open beer bottles lightning fast and is ideal for storage. Choose our 3 pack of no bend bottle openers as the perfect sleek design party favor and gift. Great for any occasion and celebration, our beer bottle openers have been used at weddings, birthdays, groom's parties and other large scale events. Specifications: Three pack Stainless steel Rubber coated handle 0.17 Pounds per bottle opener Measures 7 inches in length Buy your durable bottle opener today and save! Our premium quality products are backed by our money-back guarantee. If you are not 100% satisfied we offer a full replacement or refund, no questions asked. 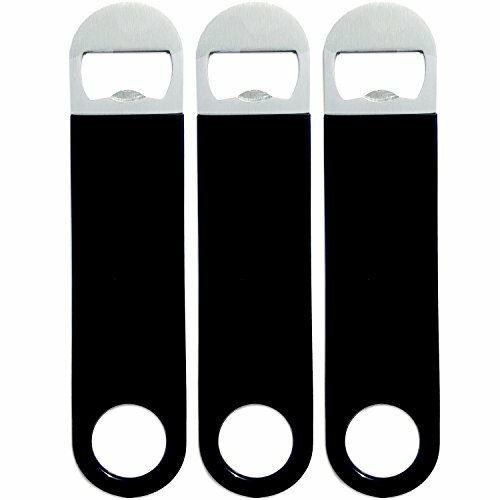 3 FLAT BOTTLE OPENERS - Classic stainless steel beer bottle opener with black easy grip rubber handle. Best sellers for Bartenders, Wedding Favors, Party Gifts and Groomsmen. DURABLE & RELIABLE - Use these heavy duty handheld bottle openers anywhere. Stainless steel openers are perfect for the kitchen counter or to open a beer outside at the BBQ. THIN - Flat bottle openers are easy to store due to their slim and compact size. Openers measure 7 inches in length. QUALITY - 3 Pack flat bottle openers are grade A heavy duty and long lasting. We guarantee our customers will love our bottle openers. If you have any questions about this product by Alpine Choice, contact us by completing and submitting the form below. If you are looking for a specif part number, please include it with your message.